How to choose diaphragm seal for pressure Instruments? - SILVER AUTOMATION INSTRUMENTS LTD.
Modern process manufacturing procedures demand ever greater accuracy and reliability from their pressure measuring instruments and in some applications, where there are chemical or hygiene considerations, it may be necessary to isolate the pressure measuring instrument from the process medium. This isolation is achieved by using a pressure-sensitive diaphragm made from a material resistant to the process medium and enclosed in a system fitted to the base of the instrument. The space between the diaphragm and the measuring element is then evacuated, filled with a suitable fill fluid and sealed. The process pressure exerts a force on the exposed face of the diaphragm and as the diaphragm flexes, it pushes inwards and compresses the fluid that is channelled directly into the measuring element. When the process medium is corrosive to the working parts of a standard pressure gauge or transmitter. The process medium is viscous or contains solid particles that could cause the inlet to become blocked. The process medium is prone to solidifying over time e.g. it may freeze as the temperature drops or it may set as it dries. It is important to eliminate the formation of bacteria in the process connection such as in food and beverage applications. Avoiding common mistakes will improve the chances of successfully selecting and installing a diaphragm seal. * A diaphragm that is too small in diameter or not flexible enough to allow for natural thermal expansion of the fill fluid, leading to zero shifts and false pressure readings. * The process or ambient temperatures exceed the acceptable service range of the fill fluid. * In differential pressure applications, very small differential readings may not be possible owing to the amount of force required to drive the diaphragm and the measuring element. * The fill fluid inertia is greater than the force required to move the measuring element. * The length and internal diameter of capillary in combination with the fill fluid viscosity create resistance, driving up system response time to unacceptable levels. * The process temperature can influence the ambient temperature close to the process. * Care should be taken when specifying a seal system for measuring a vacuum or high vacuum pressure. While they perform normally for most standard vacuum applications, as the pressure moves closer to a perfect vacuum, acceptable accuracy levels become more difficult to achieve. Diaphragm seal accuracy at 20°C may vary according to chemical properties and these values must be added to the accuracy class of the instrument. The accuracy of vacuum however cannot be guaranteed beyond -0,85 bar in standard executions. This is due to the fact that most filling fluids contain microscopic amounts of air or trapped gases, which tend to expand significantly as a pressure of absolute zero is approached. This expansion affects the measuring element in the instrument. The complete pressure sensing system is filled with an appropriate process filling fluid at a specific temperature (generally 20°C) called the reference temperature. An increase or decrease of ambient temperature or of the process fluid makes a proportional variation in the fill fluid volume. Consequently this has an impact on the internal pressure of the closed sensing system that could result in a zero error in the instrument. To minimise this, it is necessary to compensate for the volume variation caused by temperature. Small diameter diaphragms may compensate only for a small variation of volume. It is suggested to use, according to the process conditions, chemical seals with diaphragms of the biggest possible effective diameter. Furthermore, when the process temperature exceeds 150°C, but is lower than 250°C, it is necessary to install the instrument with a cooling tower to avoid the effects of the thermal transmission between diaphragm seal and the instrument. Above 250°C a capillary line should be used to protect the instrument from high process temperatures. The fill fluid used is very important for the temperature application range of the chemical seal, so the minimum and maximum temperatures of the process medium must be considered. Additionally the fill fluid must be compatible with the medium, especially for media such as oxygen or for applications in the food industry. This is important in case the diaphragm is ruptured and as a result the fill fluid is able to mix with the process medium. The use of a capillary allows remote reading of the instrument and limits the effects of the process temperature (above 250°C) on the accuracy of the instrument. A capillary length of 500 mm is normally adequate to maintain the temperature of the instrument close to the ambient value. The length of the capillary should be as short as possible. It is advised not to exceed six metres, because the temperature variation on the capillary length may influence the accuracy and response time. 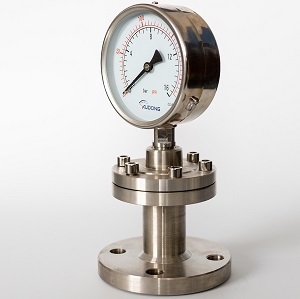 Pressure instruments with a capillary require a suitable wall or panel mount flange or bracket to mount the pressure gauge or transmitter. A difference in height between pressure instrument and the diaphragm seal adds an increase in the total error due to the hydrostatic effects on the fill fluid, often referred to as head pressure. If such difference is known, compensation during manufacture or in the spot zeroing will be required. Diaphragm seals can be fitted to most of pressure gauges, transmitters or pressure switches. Start to finish in-house manufacturing caters for the development of customised seals for unique OEM applications and the fitting and filling of diaphragm seals to instruments from other manufacturers can be done with minimal delay.